Technology is advancing at an exponential rate. Cities are beginning to resemble the Byzantine monstrosities depicted in Ridley Scott’s “Blade Runner”. We now can communicate with nearly anyone in the globe, with great immediacy– often with visuals. We can kill thousands, even millions of people using unmanned weaponry. We have become better and better at treating illnesses and disease, often using medical technology. What to say? Some suggest we have entered a new paradigm– a “Second Machine Age”. Others cling to the notion that machines are unnecessary– avoiding computers, the internet and cell phones. The future of people may depend on what side of the technological divide they stand– those who use tech and those who avoid it or can’t afford it. 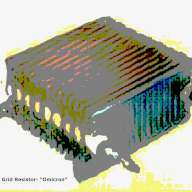 I conceived of “Grid Resistor” in 2017, upon retiring my act “Mystified”. I thought of a music that reflected today’s (and tomorrow’s) technology– containing only the sounds of machines. I used a contact microphone and other means of capturing to record dozens of machines in the highest audio quality possible. Some sounds were treated with random effects processing, while others were dubbed directly into pieces. Each track was named after the date of its composition and the number within the various tracks that day that were written. Very little reverberation was added, in order to emphasize texture and avoid distortion and sound loss. Songs were comprised of many layers, usually using sounds collected from different devices. To what end? 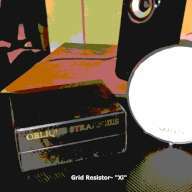 Here, in “Omega”, we have the sum total of solo Grid Resistor tracks. MP3s of the highest quality were uploaded (lossless files would have been too cumbersome). 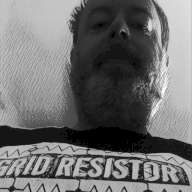 These mp3s are all on one release page so that listeners can move through the totality of Grid Resistor tracks, or cue them up in a playlist and set them on “shuffle” and “repeat”– and so for your ears, the future is here, or quickly approaching. Do you accept the assistance of machines? Use them as tools? Or destroy them, sending them to the trash heap? All sounds in this recording were made by machines. All sounds in this release were created by machines. Various machine sounds were used as the only sources in this dark, atmospheric Grid Resistor track. 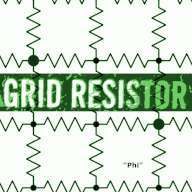 In this release, Grid Resistor mixed together machine sounds, as captured by a contact microphone. The artist used Brian Eno’s “Oblique Strategies” deck as a tool for decision-making, for each sound in all three tracks.